Hundreds turned out for the first-ever Weather Connection event at Texas Live! The weather on the first day of spring was perfect for the information-packed and fun-filled afternoon with NBC 5 Weather Experts and Telemundo 39 La Autoridad en el Tiempo. Hundreds Turn Out for Weather Connection Event at Texas Live! 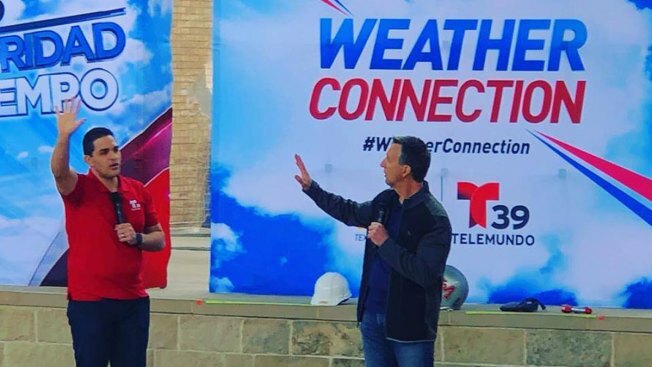 NBC 5 Chief Meteorologist Rick Mitchell and Telemundo Chief Meteorologist Néstor Flecha teamed up to present storm safety information on the main stage. Fans also got a chance to meet other members of the NBC 5 and Telemundo 39 weather teams, as well as take an up-close look at weather forecasting technology and the Texas Storm Fleet. Texas Lightning Truck and Texas Thunder Truck were positioned inside, while Texas StormRanger was outside. NBC 5 and Telemundo 39 swag was also handed out including fridge magnets reminding everyone what to do in the event of a severe storms. NewsRadio 1080AM KRLD’s Dan Brounoff was also on hand to hand out swag, meet fans and talk about spring weather safety. The Perot Museum of Nature and Science offered hands-on weather experiments and fun activities and demonstrations. Spring in North Texas can present serious weather threats. Weather Connection was an opportunity to educate residents whether they are new to North Texas or long-time residents. Stay tuned for future Weather Connection events! NBC 5 Chief Meteorologist Rick Mitchell can be seen weekdays on NBC 5 at 4 p.m., 5 p.m., 6 p.m. and 10 p.m. He has had close encounters with severe weather for the majority of his career. While serving as chief meteorologist at KOCO-TV in Oklahoma City, Mitchell experienced a tornado touch down on the station grounds while covering severe weather on-air on June 13, 1998. To learn more about Rick Mitchell, go to GetRick.tv. Facebook: @RickMitchellWX Instagram: @rickmitchellwx Twitter: @RickMitchellWX. Joining Mitchell is Telemundo 39 Chief Meteorologist Néstor Flecha, who can be seen weekdays at 5 p.m. and 10 p.m, serving the Spanish-speaking audience of North Texas. Flecha has worked on the implementation of new radars, meteorological models and augmented reality for Telemundo 39 and NBC 5. Contact Néstor Flecha on his Facebook page @nestorflechatv, Instagram @nestorflecha and Twitter @nestorflecha.